The ICO market has not collapsed. There is still more money being raised by ICO’s in 2018. December 2017 ended with a new record of $1.1 billion raised, and the first quarter of 2018 with its $5 billion raised already exceeded the whole of last year. The overall volume of ICO projects in 2018 could reach a breathtaking $12-15 billion and even more. And if besides Telegram, other large players such as Viber turn to this market for financing, then the figures will be even greater. 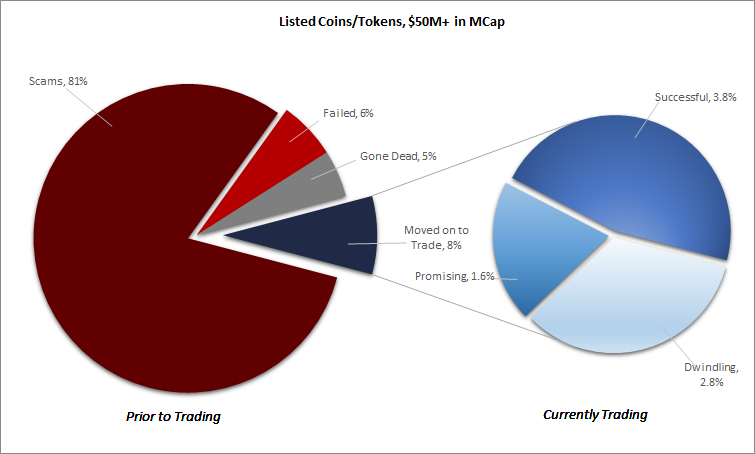 Bitcoin.com has surveyed 2017 ICOs and found that of 902 tracked by TokenData, 142 failed before raising funding, and another 276 failed after fundraising. Bitcoin.com found another semi-failed 113 projects because their teams have gone off the radar or their community has withered away. The failed and semi-failed rate is over 59% at Feb, 2018 for 2017 companies. Bitcoin.com says the total funding of failed projects from 2017 was $233 million. As many as 75% of all startups backed by traditional venture funding fail, and 30 to 40% of those take all of investors’ capital with them. Out of all new companies started in the U.S., a little over 20% fail in their first year. There have been big ICO winners. 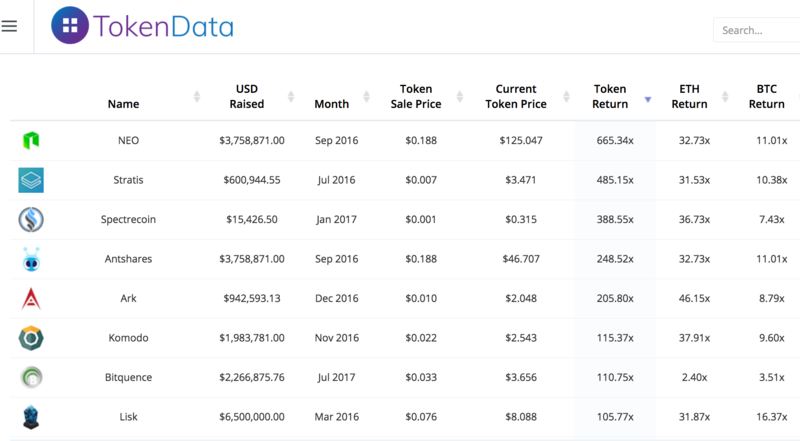 Various ICO that have had large token price increases are NEO, Stratis, Spectrecoin, AntShares, Ark, Komodo and others. – 8% actually made it to market. · Scam (pre-trading): Any project that expressed availability of ICO investment (through a website publishing, ANN thread, or social media posting with a contribution address), did not have/had no intention of fulfilling project development duties with the funds, and/or was deemed by the community (message boards, website or other online information) to be a scam. · Failed (pre-trading): Succeeded to raise funding but did not complete the entire process and was abandoned, and/or refunded investors as a result of insufficient funding (missed soft cap). · Gone Dead (pre-trading): Succeeded to raise funding and completed the process, however was not listed on exchanges for trading and has not had a code contribution in Github on a rolling three-month basis from that point in time. · Dwindling (trading): Succeeded to raise funding and completed the process, and was listed on an exchange, however had one or less of the following success criteria: deployment (in test/beta, at minimum) of a chain/distributed ledger (in the case of a base-layer protocol) or product/platform (in the case of an app/utility token), had a transparent project roadmap posted on their website, and had Github code contribution activity in a surrounding three-month period (“Success Criteria”). · Promising (trading): Two of the above Success Criteria. · Successful (trading): All of the above Success Criteria.